Buying furniture is a big investment. We spend thousands to ensure that we get pieces that will last a lifetime, and yet we still put them through the ringer on a daily basis, especially in kid- and pet-friendly households. At Collections Etc., we know how important it is that you maintain your furniture so that you have a comfortable, enjoyable living environment no matter what. That’s why we offer a full suite of furniture solutions that are specifically designed to help clean, maintain, repair and preserve furniture. Shop our enormous variety of slipcovers to find easy-to-use covers that help protect your favorite furniture pieces from stains, fur, scratches and other damage. Whether you’re in need of utilitarian chair covers to keep fur under control or want to jazz up your old, dingy sofas with slipcovers in bright, refreshing fabrics, you’ll find the covering solutions here to suit your needs. 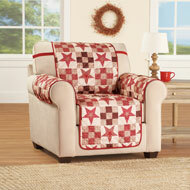 Grab a style to revamp and protect any sofa, loveseat, chair or recliner. 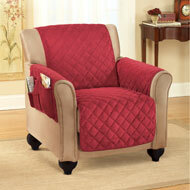 Padded covers help add cushion and comfort, while plastic options keep upholstery stain- and dust-free. 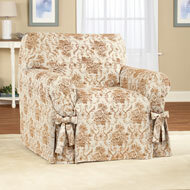 In addition to furniture covers, Collections Etc. 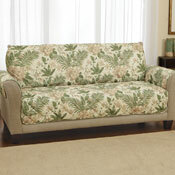 also offers other solutions to help repair and spiff up your furniture. Add wonderful and convenient accessories like cup holders (because you can never have enough of those) and furniture pockets and caddies to keep your remote controls, magazines, knitting supplies and more well-organized and within arm’s reach. Explore this entire department for more sensible furniture care products, including chair cushions, stain removers, leg rests, pet mats, fabric pins and furniture replacement parts that keep your set in tip-top shape.